Motorola has adopted a commercial strategy a little bit unusual. The price of Moto G is so tightly adjusted that the company hardly gets a 5% profit for the sale of each device. This policy contrasts with the profit rates of companies like Samsung (which gets a 20% profit for the GS3 Mini and a 28% for the GS4) and specially Apple (whose profit rates raise almost to 35% for the new iPhone 5C and 5S). Even though these numbers are not strictly correct (they appear as estimation in an article published by the Wall Street Journal last December 6th), they give an idea about the strategy chosen for each company. To understand this situation, we need to look at the greater picture. 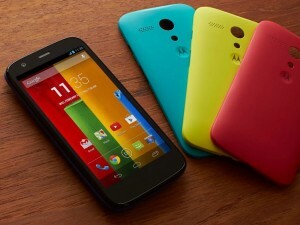 With this device, Motorola is trying to make a good number of sales, opening the gates to the worldwide market. Moreover, Motorola is offering a mobile with good mid-end characteristics and a pretty good hardware, with an excellent performance. With such a device, the image of Android could increase, in a sector of the market that have traditionally been nurtured by shoddy devices that have created the impression that Android does not work well. If Motorola manages to expand and reaches a bigger number of users, la brand would gain visibility and probably there would be more people potentially interested on its flagship, the Moto X. This is not a new strategy at all, as Amazon is doing something similar with the new Kindle Fire HDX. Accodding to Jeff Bezos, Amazon’s CEO, the company expects to gain money from the people when they use the devices, not from the sale of the device itself. In this case, the profit moves to the content consumption (books, games, music, and video). In a similar way, Motorola probably expects that the rising number of Moto G’s devices has repercussions in the sales of its flagship smartphone, the Moto X.